Looks like it was taken from a very old camera. The film’s grain appears much sharper than grains of sand. The blue in the sky is paler than it should be, blurring the lines between sea and sky. Cameras back then weren’t made to capture reality as it is–they were made to capture something rawer, perhaps those moments we don’t have the capacity to store in the hard drive that is our brain. I must’ve been between four and six, and he was old. I remember him old. He was old since the day I was born. Daddoo and I sat close together on the shore, his arms around me. This wasn’t a photo we’d posed for, because we weren’t facing the sea. My father usually composed the frame better than this–it’s his job, he’s a director. But I assume it was him, because Daddoo and I are sitting a safe distance away from the “deadly currents” Bombay’s tides bring with them. We were playing, or we must have been. Both of us are smiling. I don’t remember him like that. Daddoo was strict and stern, was tall and stood like it. He carried himself better than most grandfathers do. Vibrant, freshly ironed shirts tucked into trousers, fell elegantly from his waist. Everything was smooth as silk, precise, as if it were done mathematically. Most Indian grandfathers look old and broken down, but Daddoo was different. He looked sharp, always, his broad shoulders spread wide over an upright chest. His hair– which he had more than most people his age–was wavy and had a natural, wild kind of movement to it. Like Einstein’s, but less straight or frizzy. He combed it back, keeping it as close to his head as possible. But it always resisted, wild and free. So, he kept a comb, in the left pocket of his shirts, close to his heart. His jaw wasn’t that strong, but it used to be. With age came dentures. When he wore them, his jaw was as square and strong as ever. When he didn’t, the sides of his cheeks collapsed in wrinkled waves, into his face. He didn’t have the biggest eyes, but the dark circles below them, those were big. So, he wore shades to cover them. His ears grew vertically, longer with age. Gravity had been trying to pull him down for years, and though it couldn’t get to the rest of him, it got to his ears. Another photograph of Daddoo shows him holding a sparkler during Diwali, the playful festival of lights. His hand by his side, his elbow bent, he holds the sparkler low. It’s if he were holding a pistol, like the cowboys did in old cowboy movies. From his expression, it doesn’t seem like he is holding a sparkler. People swim around him, smiling, their sparklers swirling in the night sky. In the picture, Daddoo doesn’t smile. In the midst of this celebration of light and life, he stands still. Daddoo stood always at attention. The Indian army had left an indelible mark on his existence, and he was proud of it–you could tell, because he would tell you. He liked you more if you remembered his rank, and perhaps not at all if you didn’t. He was the lightest sleeper I knew–even a rustling feather would awaken him. I always wondered if this restlessness was bound up in memories of the war, or if he was born that way. He’d told me once of a war he’d fought in: “A Chinese soldier once shot at me while I was healing my comrade. They’re not supposed to do that.” I learned then, that even wars have rules. His life was a tug of war with death. Death tugged hard, Daddoo tugged harder. Once, when he had returned from a hospital: “You want to see what they did to me?” Daddoo showed me his stitches–stitches that began at his chest and went down, all the way to his feet. After one of his heart attacks, he was forced to have open-heart surgery, so he had to be torn apart, then stitched back together again. But it didn’t let it interfere his life, except when it came to seatbelts, he never wore them–they pushed at his chest. If a traffic cop stopped him, he would show him his army ID, and they would break into a salute. If they still insisted on him wearing one, he would show them the stitches. I knew him as a man who’d survived wars, a helicopter crash, over three heart attacks. He changed in his few last years, the cancer got to more than just his body. He needed a nurse to help him move around. He knew his time was short. With every passing birthday or anniversary, he knew. Cancer changes a man. He began a countdown, starting from nowhere and ending some place he didn’t know and didn’t want to be. As the cancer snuck up on him, invaded him, he began to put pictures of everyone he loved on his walls, so they would be right before his eyes, until his dying breath, even if they weren’t there in person. On his wall, there was a picture of my father–one in which he was a child, playing in Daddoo’s arms. There is another of my uncle, a picture of me as a toddler and another of me playing guitar. And one with my mum. There were pictures of him in his army attire, standing at attention, alongside the president of India, and one with his fellow soldiers in front of an army helicopter. If he were here today, I would give him the photograph of us at the beach, the sea behind us, its currents pushing and pulling, me safe in his arms, and him, smiling. Maybe he would hang it on his wall with the others. To show a different side of him, a sight we didn’t often see, him–ecstatic and happy. Another side of a man I once called Daddoo. Shivam Sengupta is from Mumbai, India. She composes music and writes songs, and is currently a CWP Major at Berklee College of Music. Once, she used to be a copywriter at an ad agency, but soon decided it wasn’t for her. Instead, she is following her dreams. 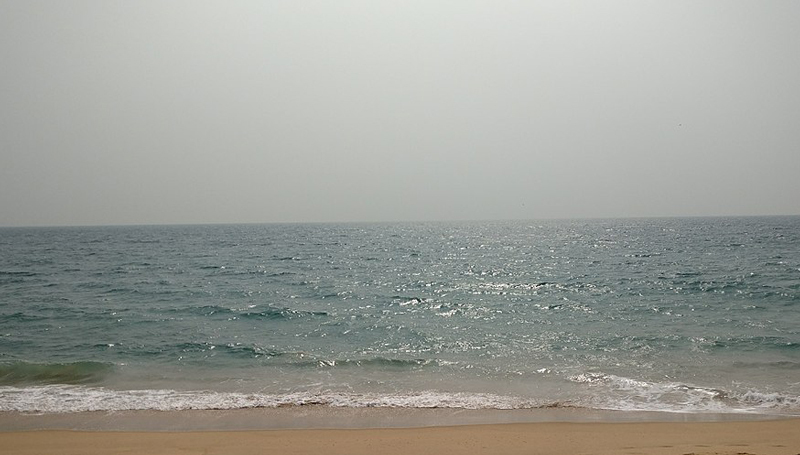 Featured Artwork: CC BY-SA 3.0, https://commons.wikimedia.org/w/index.php?curid=296822, Image of Arabian Sea from Bombay, India taken in year 2005 by Abhishek Madhani.